FEW THINGS are more quintessentially New England than a McIntosh apple. Its abundant, red-and-green fruit has been filling our orchards and beguiling our senses with a heady fragrance and explosive, sweet-tart flavor for more than a century now. McIntosh today account for about two-thirds of the New England crop. McIntosh apples are known for their “strawberry or even elderflower flavor and sweet, glistening, melting, juicy, white flesh,” write John Morgan and Alison Richards in The New Book of Apples (Ebury Press, revised edition, 2002). It’s not just the McIntosh’s outstanding fragrance and distinctive flavor that we value; they have had a far-reaching effect on the nation’s apple crop. “McIntosh has lent its good genes to several well-known varieties, including Cortland, Empire, Macoun and Spartan,” writes Roger Yepsen in his beautiful book, Apples (W. W. Norton and Co., 1994). Yepsen’s volume is small in size (5”x6-1/2”) but long on information, with descriptions of more than 90 varieties with accompanying illustrations by the author, and a wealth of background on this amazingly diverse fruit. 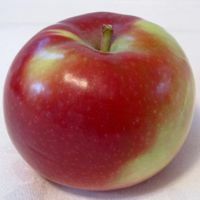 The McIntosh is a cross between a Fameuse (also known as a Snow apple because of its bright, white flesh) and a Detroit Red by the Canadian farmer who gave the variety its name. It was discovered around 1800, but it was not until 1870 that the son of John McIntosh introduced the apple commercially. The main knock against Macs is that they break down in cooking, making them ideal for applesauce but mushy in a pie. Some people prefer it that way, but if you like a firmer texture in your pie without sacrificing the superior McIntosh flavor, combine several Macs with two or three varieties that hold their shape better, such as Cortland, Ida Red, Northern Spy. McIntosh apples also require careful handling, as they bruise easily and lose their crispness more quickly than some varieties, if not kept cold. At their peak flavor fresh off the tree, properly handled McIntosh in controlled atmosphere (“CA”) storage and then home in your refrigerator can be enjoyed throughout the year. If you want fresh Macs, don’t delay this autumn; with the earlier-than-usual crop McIntosh may be done being harvested by mid-October rather than at the end of the month. As always, call your orchard ahead of time to see what varieties are available for sale or for picking. Here’s a fabulous recipe featuring McIntosh for Apple Squares, passed down three generations by Margaret Richardson of Holden, Massachusetts. Two ingredients make it stand out: cornflakes, which are added to the filling to retain the McIntosh’s juices and give the squares texture, and a few drops of almond extract, in the icing. For a healthier version, use half whole wheat flour, reduce sugar to ¾ cup, reduce butter to 3/8 cup and add ½ cup canola oil. Beat egg yolk in measuring cup and add enough milk to make 2/3 c liquid. Cut butter into flour and salt. Mix wet and dry ingredients together into a dough. Roll out half the dough so that it fills the bottom and sides of a 15-1/2” cook sheet. Sprinkle with cornflakes. Top with apples. Combine sugar and cinnamon and sprinkle over apples. Roll out other half of dough and place on top of apples. Seal edges. Cut holes in top to let steam escape. Bake at 375° for 50-60 minutes, until crust is nicely browned. Mix confectioner’s sugar with 3-4 t milk and almond extract. Drizzle over warm squares. For additional apple recipes or to learn more about New England varieties, visit http://www.newenglandapples.org/. I really have a hard time down here getting the McIntosh apple. They sell as such, but are definitely not. We live in SW Pa. I combine them with Granny Smiths for my pies, streudels, etc. Do you know of any orchards that are still growing the pure McIntosh?